On several occasions when working out examples in the earlier chapters, we came across problems that had more than one solution. Such situations are not uncommon when studying nonlinear problems, and we are now going to examine them in detail. The first step is to determine when multiple solutions appear. Once the solutions are found, the next step is to determine if they are stable. Thus, we will focus our attention on what is known as linear stability theory. 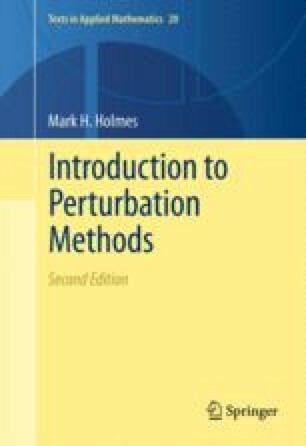 In terms of perturbation methods, almost all the tools we need were developed in earlier chapters. For example, the analysis of steady-state bifurcation uses only regular expansions (Chap. 1), and the stability arguments will use regular and multiple-scale expansions (Chap. 3). On certain examples, such as when studying relaxation dynamics, we will use matched asymptotic expansions (Chap. 2). G. Akay. Process intensification and miniaturisation, 2010. http://research.ncl.ac.uk/pim/resea.htm. S. Haszeldine. Diagenesis research at Edinburgh, 2010. http://www.geos.ed.ac.uk/research/subsurface/diagenesis/. MEIAF. Micro-environmental imaging and analysis facility, 2010. http://www.bren.ucsb.edu/facilities/meiaf/.